Could This High-Yield Stock Get Forced to Make an Acquisition? MPLX LP's parent company just acquired another midstream partnership, and that could force a merger down the road. 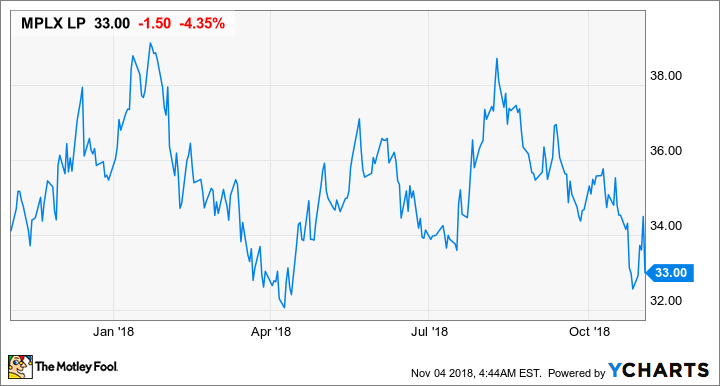 With a massive growth pipeline ahead of it, there isn't any need for midstream master limited partnership MPLX (NYSE:MPLX) to make an acquisition right now. The company's portfolio of growth opportunities is massive, and it appears to have the strength to handle the financing on its own. That may not matter, though, as MPLX could be forced to make an acquisition in the near future whether it wants to or not. Let's look at MPLX's most recent earnings and see why it may have to make an acquisition, and why that may not necessarily be a great thing for the company right now. DATA SOURCE: MPLX EARNINGS RELEASE. EPS = EARNINGS PER SHARE. MPLX's year-over-year growth came from the one-two punch of organic growth projects and dropdown acquisitions from its parent company, Marathon Petroleum (NYSE:MPC). Much of that organic growth comes from its gathering and processing segment, which started up 1.1 billion cubic feet per day of natural gas processing capacity at six separate plants so far this year. Even its logistics and storage segment, which has historically grown as a result of dropdown acquisitions from Marathon, grew 24% year over year, excluding the impact of dropdown acquisitions. Combined, the company increased adjusted EBITDA by 74% compared with the prior year. Also, the company's distributable cash flow grew enough that the company posted a distribution coverage ratio of 1.47 even though it increased its payout 8.5% over the prior year to $0.5375 per unit. MPLX was able to retain about $240 million in excess cash flow to plow back into growth projects. Data source: MPLX LP. Chart by author. It will be a partner in the Permian Gulf Coast Pipeline with Magellan Midstream Partners, Energy Transfer, and Delek US Holdings. The crude-oil pipe is still taking customer commitments and could be as large as 1 million barrels per day. It's partnering with Targa Resources and NextEra Energy for a 2 billion-cubic-foot-per-day natural gas pipeline that will also connect the Permian Basin with multiple demand points on the Gulf Coast. It is taking requests to build a 600,000-barrel-per-day pipeline from a major crude oil trading hub in Louisiana to the loading terminal for the Louisiana Offshore Oil Port (LOOP). It would appear that, based on this pipe, MPLX and Marathon would like to start using LOOP as both an export and import terminal. These are big projects that will really move the needle for MPLX. They're also going to cost a lot, but the company is in a financial position to build them right now. With Marathon Petroleum closing its recent acquisition of Andeavor, it leaves a lingering question for MPLX investors: What on earth will management do with its two master limited partnerships? By acquiring Andeavor, it also obtained the general-partner stake and 55% of the common units of Andeavor Logistics Partners (NYSE:ANDX). The thing is, it makes zero sense for a company to own two completely separate corporate entities in the same business. At the time of the acquisition, management was deliberately vague about what it intended to do with the subsidiaries. Now that it's complete, Marathon Petroleum has telegraphed the intention to combine the two businesses, either by having MPLX buy Andeavor Logistics, or vice versa. If MPLX were to make an acquisition, though, Andeavor Logistics probably wouldn't be the first company on its list. The two businesses don't have a lot of geographic overlap and don't really enhance each other's logistic capabilities. Also, Andeavor Logistics' finances don't look as attractive as MPLX's, as its distribution coverage ratio is considerably lower, its debt-to-EBITDA levels are higher, and it relies more on dropdown transactions from its parent and equity issuances for growth. Management has said that one priority is to run Andeavor Logistics more like MPLX with a higher coverage ratio and to achieve independent sustainability with limited parent support. While management says it will explore all options, the most logical one is for MPLX to acquire Andeavor Logistics. We've been communicating for the past year our desire to focus on growing our longer-duration ratable earnings base. In a short period of time, our team has made great strides toward accomplishing this goal, and we are seeing the effect in our repeated record results, strong base business growth, and exciting new project announcements, including long-haul pipelines and export facilities. Most importantly, though, is that throughout this year, we have focused on high-grading our opportunity set and being selective toward the best return projects, so that we can continue to execute a self-funding model and finance our approximately $2 billion of organic growth capital without issuing any equity, while maintaining an investment-grade credit profile and strong distribution coverage. You can read a full transcript of MPLX's conference call. Having MPLX and Andeavor Logistics come together as a single entity could go either way, depending on how the deal is structured. While Andeavor's business is in no ways a bad one, its credit profile and finances are weaker than MPLXs and could drag down the combined entity somewhat. At the same time, the small amount of geographic overlap could present some huge investment opportunities, especially in the Permian and Bakken. If MPLX doesn't have to pay through the nose for the outstanding stake in Andeavor, it could give the company an even larger growth platform than its current one. I'm an MPLX shareholder, and I intend to hold my shares for some time. MPLX seems to have the financial fortitude to take on Andeavor Logistics without too much of an issue, if it can do so at an attractive rate. If the company is forced to overpay for the assets to make life easier for parent company Marathon, though, it could make this stock less attractive.